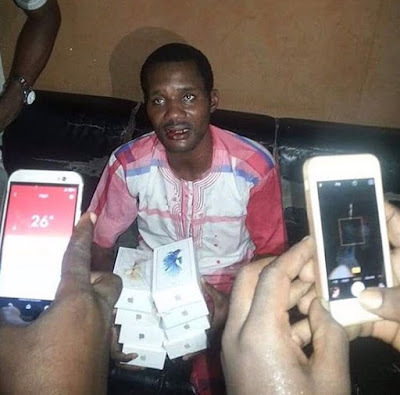 Few days ago, Toyin Aimakhu‘s ex, Seun Egbegbe was reported to have been arrested for stealing 10 iPhone 7s. The “movie marketer” yesterday released a long statement denying he had been arrested and claimed he was “chilling in his house”, he then attributed the phone theft story to misinformation by bad belle people and the media. *I cannot laugh. (See it here). Shortly after the statement was released, GoldmyneTv visited the Area F Divisional Police Station in Ikeja, Lagos and confirmed seeing Egbegbe CHILLING in a police cell and not in his house as claimed in his statement. Now I can konitinu CHILLING with my blogging. lol.